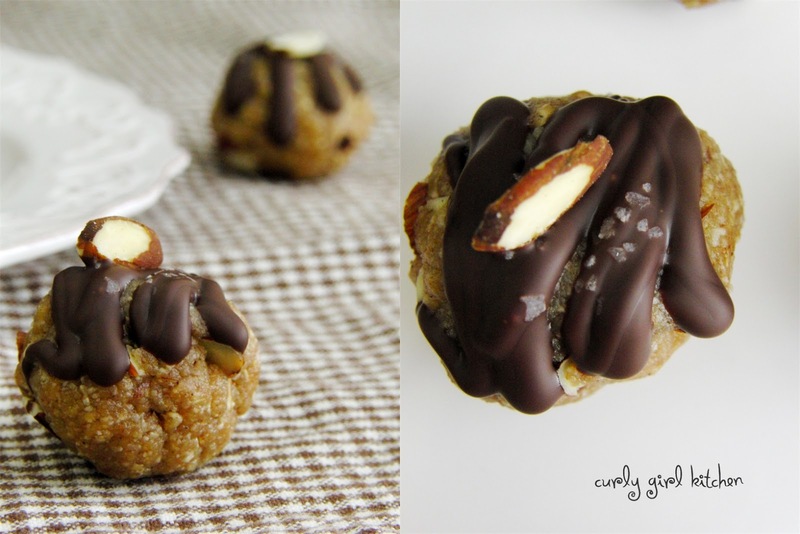 A healthy cookie that also tastes good... are they both possible? I'm not a big fan of healthy desserts that don't taste like, well, dessert, so when I set out to make a cookie with no flour, butter, oil or refined sugar, I hoped that it wouldn't taste like a mouthful of bland quinoa. Nothing against quinoa - I really like it actually - just not for dessert. Spices are important in a cookie like this to make up for the lack of butter and sugar, so I started with rolled oats and almond meal, seasoned with cinnamon and cardamom and a pinch of salt. For sweetener, a few tablespoons of maple syrup or honey and a little vanilla, and to bind it all together, all-natural almond butter and a splash of skim milk, with a handful of sliced almonds for crunch. This is a thick dough, so it's easiest to quickly mix it up in the food processor, and then it's ready to be shaped into balls. The natural oil in the almond gives it a buttery flavor, so I really didn't miss the butter at all. 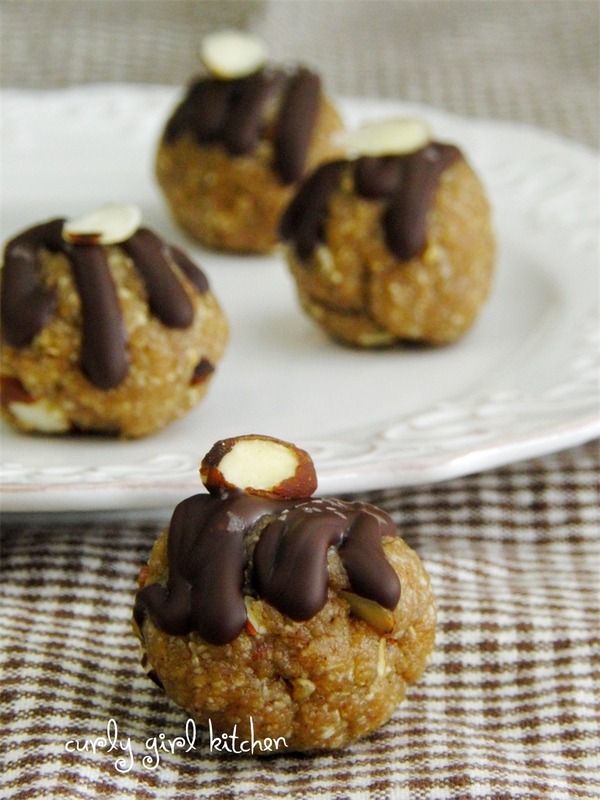 When I was planning these cookie balls, I first thought I might dip them in dark chocolate, but I didn't want to coat them in so much chocolate that they were no longer as healthy as I wanted. So instead of dipping, I just drizzled a little melted dark chocolate over the top of the cookies and garnished them with a sliced almond. I don't often include nutritional info on here, but for these I did, so that you can see that they are very close in nutrition to a handful of raw almonds, at just 100 calories apiece, and with very little sugar. I plan to keep these in the refrigerator or freezer so I can have one when I'm craving something sweet, but don't want to undo all my hard work of eating right throughout the day. In the food processor, pulse the oats, almond meal, cinnamon, cardamom and salt a few times to combine. Add the maple syrup, vanilla, almond butter and milk and pulse until very moist and crumbly. Stir in the sliced almonds. Shape the mixture into balls and set on a baking sheet lined with parchment paper. Melt the chocolate and drizzle over the top of the balls. Top each with a few flakes of coarse sea salt and a slice of almond. The cookie dough balls will stay fresh in the refrigerator for several weeks, or in the freezer for several months, stored in an airtight container. 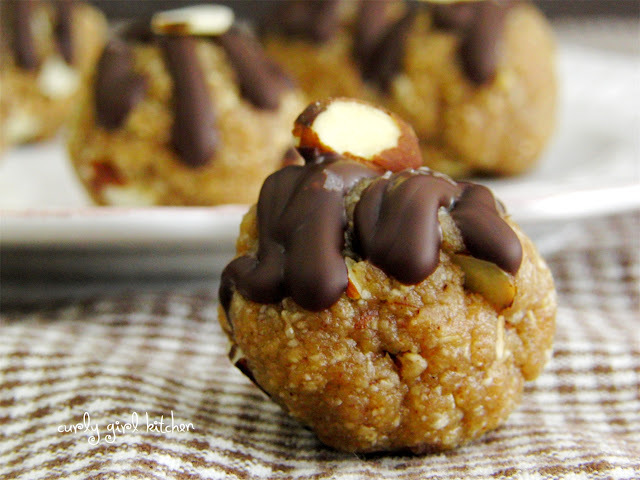 I just made these and they are yummy! I added raisins and omitted the chocolate because I didn't have any. Next time I'm trying them with chocolate!!! I'm glad you like them! I've been thinking of making another batch, maybe with some chopped dried cranberries.